I discovered that we share a birthday...pretty cool, huh? August 21st. Sure, she's eight years younger that me but hey, who's counting?!? and not to mention she has a killer voice! If so, are you sharing the love for Nashville and Hayden's style? I'd love to hear! I hope y'all have a great Tuesday. We are one step closer to the weekend! Oh, and there's a pretty awesome giveaway going on over at Because Shanna Said So. I'm giving away a gift card a special surprise. I'd love for you to enter and I know Shanna would too! Loving Nashville of course! I didn't know she was on Guiding Light but I remember her from the movie Remember the Titans and she was great--such a pretty lady! Ohhhh I love her!! I love Nashville too, we are WAY behind but I still love it! I've never actually seen Nashville but I've heard great things! Hayden is such a beauty to me. I blogged about her Golden Globes look yesterday. I think she looked stunning! 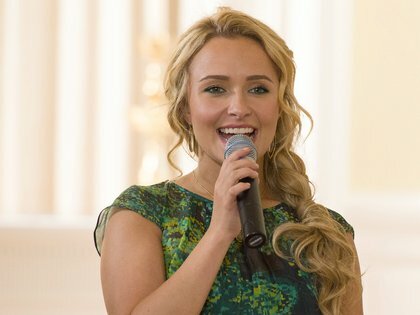 I love Nashville and will admit I totally have a girl crush on Hayden too!! Love all of her looks! That girl can do no wrong! I've never seen Nashville but I agree, she is stunning! Love your blog and happy to be following along now! would love if you stopped by mine!